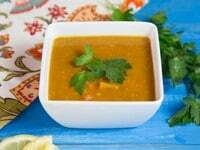 Smoky Lentil Sweet Potato Soup Recipe – Hearty, Flavorful Vegan Soup with Red Lentils, Yam Chunks, and Spices. Lentils may be popular now, but that wasn’t always the case. 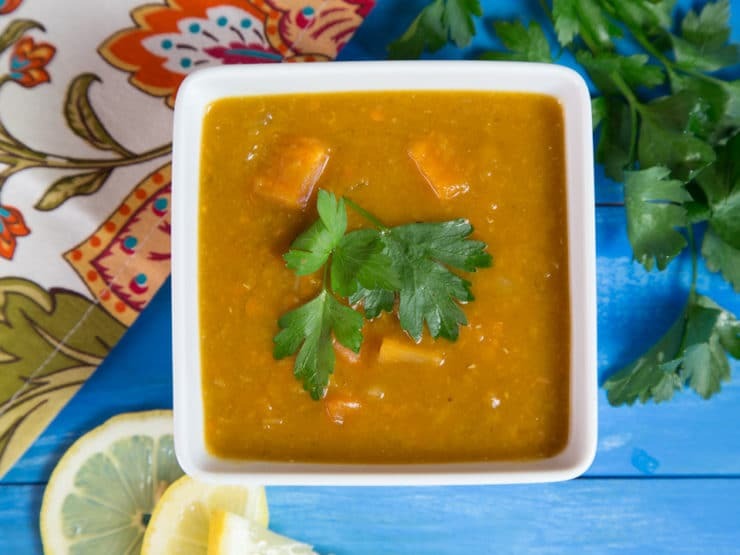 During Classical times wealthy Greeks turned their nose up at lentils, deeming them a “poor man’s food.” Hippocrates, always ahead of his time, recognized their many health benefits and prescribed lentils to his patients that suffered from liver ailments. We now know that the high amounts of choline found in lentils help to improve liver function by aiding in filtering toxins from out of the bloodstream. Though lentils have been a food staple in the Middle East and Mediterranean for centuries, they didn’t really catch on in the U.S. until World War II, when they became a popular meat substitute during wartime rationing. Lentils make a filling meat substitute in many dishes. If you’re suspicious, my Vegan Lentil Cauliflower Tacos will probably convince you. 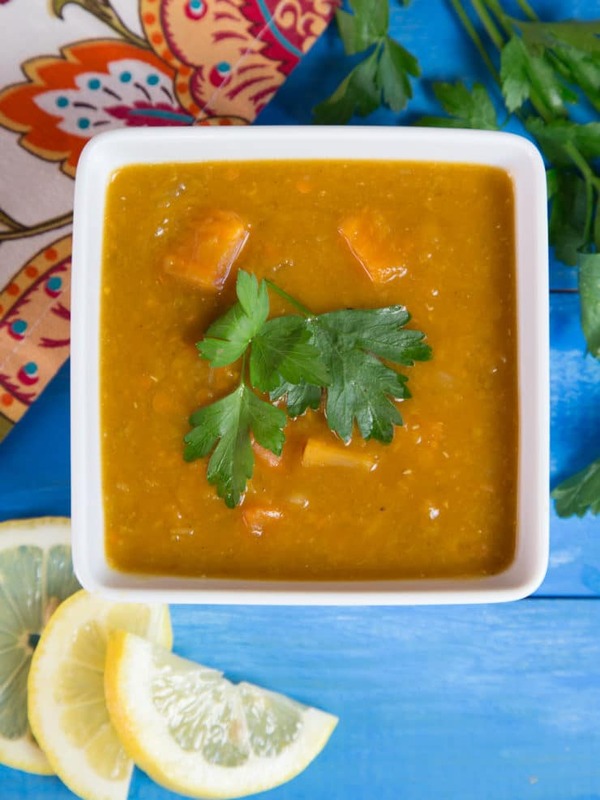 They are fantastic in this Smoky Lentil Sweet Potato Soup, which is hearty enough to serve as an entree. It’s naturally vegan, though if you don’t mind dairy I suggest topping it with a spoonful of Greek yogurt or labaneh. Yum! Heat the olive oil in the bottom of a large sauce pot over medium heat. Add the diced onions and salt and cook until onions are soft and translucent. 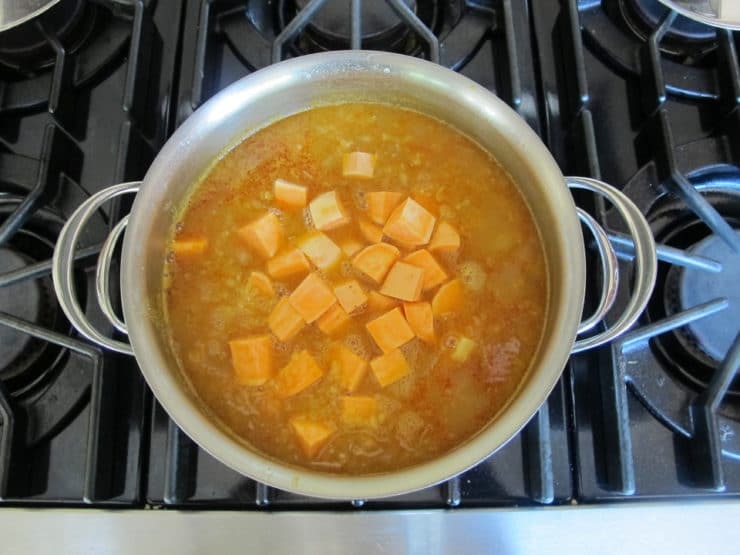 Add the stock, water, lentils and diced sweet potatoes and bring to a boil. 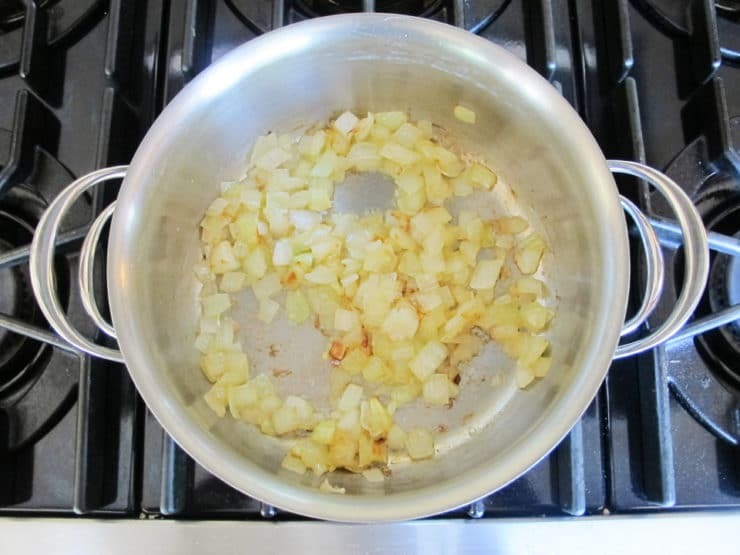 Reduce to a simmer and cover, leaving a small portion of the pot vented. Cook for 30-40 minutes, or until the lentils and sweet potatoes are tender. You can leave the soup chunky, or use an immersion blender for a smoother puree-like texture. Serve hot, garnished with lemon and parsley if desired. If you're not avoiding dairy, this soup is also fantastic served with a dollop of Greek yogurt or labaneh. Note: If you prefer a thicker soup, you can continue to cook, uncovered, for an additional 10 minutes to reduce some of the liquid. 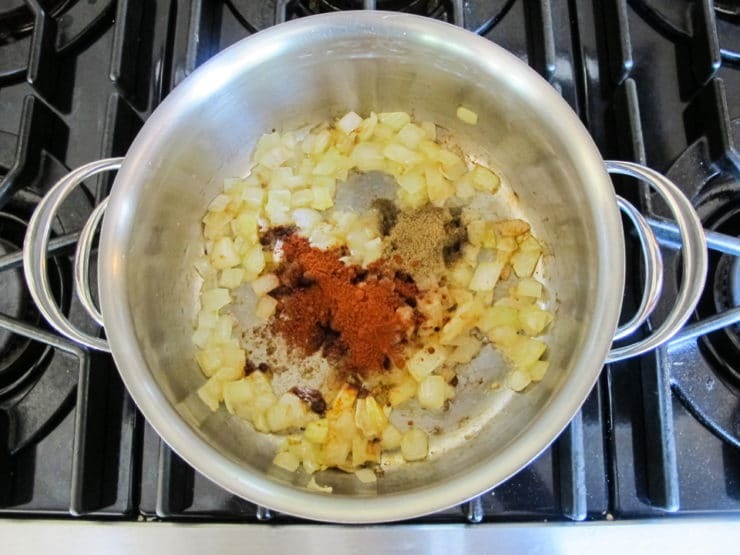 If you prefer a smooth soup you can place the soup in a blender and blend until smooth, or pulse with an immersion blender until you reach desired consistency. I am making this tomorrow and I wanted to know if it freezes well? Hi Monica, Tori’s assistant Ashley here. You can freeze this soup, but the potatoes may be a bit mushy after thawing. Delicious, easy, and healthy, what a perfect combination! Makes a beautiful soup, I am serving as an appetizer instead of chicken soup for something different. Thank you for this wonderful recipes, and all your recipes! I can always count on you to have something yummy for me to make! I made this soup for my 21 month old toddler. He loves lentils and eats them almost every day. To make this soup kid friendly I only added half of the smoked paprika, added an extra teaspoon of cumin seeds as my son loves cumin, and also added a half teaspoon of caraway seeds. I puréed the soup to a slightly chunky consistency. I served it with some organic butter melted in. It was sweet and savory, not spicy. I did have to add extra water as the soup became so thick. Very good soup and for adults I added paprika to taste and it was very smoky and flavorful. Wonderful flavorful soup. My husband loved it and he’s normally not a fan of lentils. So easy to make and filling. Love this soup! So happy you had a chance to try it Karen! Looks wonderful! I will make this tonight and serve it with Ina Garten’s Fresh Corn Salad (fresh corn, red onions, basil, cider vinegar, olive oil, and S&P). Question for anyone. Does anyone else have trouble digesting lentils? Just curious. Yes Stephanie, I have a problem digesting beans, also, which can be tough when one is a vegetarian. I read this years ago in a British Vegetarian cookbook (sorry can not remember the title) this “trick”, after soaking the beans overnight, dump the water, rinse, and plop in a pot big enough to hold them and cover with about twice the amount of water as beans. Bring to a boil and boil hard for 10 minutes. Please note, this was for all beans, lentils and split peas. Now because my body has, after all these years, adjusted to beans, I do my lentils at only 5 minutes, other beans at 10 and kidneys at 15 minutes of a hard boil. Then drain the beans, rinse, and now start your recipe with the water it states, etc. What you are doing is getting rid of the “bean sugar” that causes the discomfort. But please watch your cooking time! That hard boil, almost a “precooking” so to speak, will reduce the over all cooking time by at least 10 minutes. Hope this helps. I actually came up with this recipe few months ago, about the same cooking procedure and spices! It turned out one of our favorite soup recipes. One thing to be aware about the amount of lentil. They thicken soup when being kept for several days. Heat first then add little by little water to desirable consistency. I ended up reducing amount of lentil and purée after being cooked with sweet potatoes. It leaves nice looking dark minutes in the soup then I add onions and spice then last garnish with fresh cilantro.